Michigan faces Illinois this evening (9 p.m., ESPN) with hopes of keeping its slim NCAA tournament chances alive. The Wolverines won the first matchup thanks to six threes from Aubrey Dawkins, but will have their hands full against an Illinois team that has won its last three games. Michigan travels to Champaign tonight to face one of the hottest teams in the Big Ten, the Illinois Fighting Illini. Michigan’s come-from-behind second half win over the Illini feels like ages ago, with Caris LeVert and Derrick Walton both now removed from the equation, but the Wolverines should take some confidence from already having beaten Illinois once this season. The Illini rebounded from a 3-5 conference start with a three game winning streak that which includes a statement win at Michigan State on Saturday. Illinois has only lost once at home this season, to Indiana in mid-January, but isn’t without its own personnel absences. John Groce reported on Wednesday afternoon that Rayvonte Rice and Aaron Cosby, who combined for 15 points and six assists in the first meeting, both remain suspended ‘indefinitely’. Illinois is squarely on the NCAA tournament bubble, projected by Joe Lunardi as one of the last four teams in, and a home game against Michigan is one that Groce’s team simply has to have. The Illini are hosting an ‘Orange Out’ and the students, players and everyone else in attendance won’t forget the 31 point beat down that Michigan put down last March at the State Farm Center to clinch the Big Ten title. Illinois has the No. 9 offense and No. 7 defense in the Big Ten, very much fitting the mold of middle-tier .500-level Big Ten team. Illinois isn’t great at much offensively other than valuing the basketball — just a 16.2% turnover rate — and making free throws — league best 82.5%. Similar in many ways to Michigan, the Illini take a lot of threes in no small part because they can’t make twos very effectively. The Illini are shooting 41.8% on twos (13th) and 36.1% on threes (4th) and attempt 37.4% of their field goals from outside. Defensively, Illinois does a good job of not fouling (30.8% free throw rate allowed, 2nd), defensive rebounding (28% offensive rebounding rate allowed, 4th) and forcing turnovers (18.8% forced turnover rate, 5th). Despite ranking in the upper-half of the Big Ten in three of the four factors, Illinois has struggled with the most important one: forcing missed shots. Big Ten foes are shooting 49% on twos (9th) and 35.4% (12th) on threes against the Illini for a 50.6 eFG% (10th). The key for Illinois to win games has been its defense. The Illini are 15-1 when they hold opponents to a point per possession or less and just 1-7 when they fail to meet that benchmark. 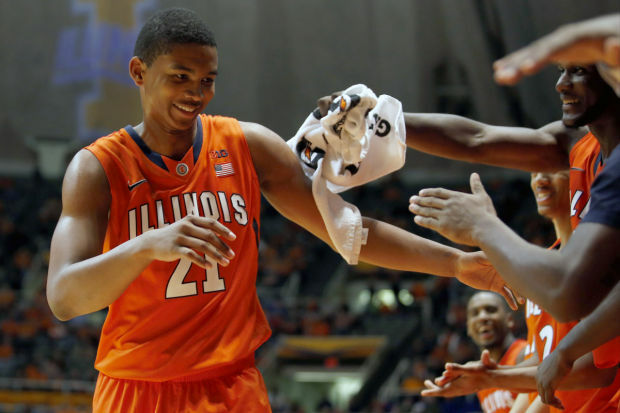 When Rayvonte Rice got injured earlier this season, I figured it could still workout for Illinois because Rice really struggled in Big Ten games last season and because it meant more shots for two players that need them: Malcolm Hill and Kendrick Nunn. Both Hill and Nunn are 40-40 guys that shoot better than 40% on twos and threes in Big Ten play. Hill is connecting on 46% of his twos and 42% of his threes, while Nunn is making 42% of his twos and 40% of his threes. Hill is averaging 16.9 points per game in Big Ten play and Nunn isn’t far behind at 14.4. It was Hill who shredded Michigan in the first meeting, finishing with 19 points on 7 of 12 shooting. He’s a great option in the mid-range, from three and even with his back to the basket against smaller defenders. Nunn is primarily a threat from deep, given his poor interior shooting, and he does a great job of moving without the ball and finding open threes. You never quite know what to expect from senior big man Nnanna Egwu. Egwu is shooting 47.9% on twos and is 3 of 9 on threes (with all three makes on Saturday against Michigan State). He’s a capable post-up player, an above-average rebounder, and can knock down mid-range jumpers, but for whatever reason he has the tendency to drift and never seems to dominate games as much as he could. Sophomore point guard Jaylon Tate replaced Ahmad Starks in the starting lineup shortly after the Michigan game and Tate is a much better distributor, but he can be turnover prone. He does a great job of getting to the line (and he’s 27 of 28 on freebies in league play), but he’s not a shooter. He’s shooting just 44.8% on twos and is 0 of 8 from three-point range. Starks isn’t the same level of distributor, but he values the basket and can make threes (34% in Big Ten games). He’s not a threat attacking the basket, shooting just 24% on twos in Big Ten play. Sophomore Maverick Morgan and Leron Black provide reserve minutes in the frontcourt. Morgan is the backup five, but shoots just 36% on twos, while Black is a rugged four-man that is strong on the glass. Keep switching defenses: Illinois isn’t a high-turnover team, which makes the December collapse in Ann Arbor so surprising, but the Wolverines have no choice but to throw every defense at Illinois and keep it off balance. Expect to see man-to-man, 2-3 zone and 1-3-1 zone in different spurts as U-M tries to slow an inconsistent Illini offense. Find inside offense: Both of these teams shoot a lot of jumpshots, but Michigan helped turn the game in Ann Arbor when it was finally able to find some easy points around the rim. Ricky Doyle had 13 points in that game and Caris LeVert hit 8 of 14 two-point attempts. Of course it was Dawkins’ 6 of 7 three-point shooting that opened things up, but finding those easiest points at the rim will be critical. Move the ball: Assists per made field goal is arguably the most important statistic to Michigan’s offensive success. When the U-M offense scored 38 points in its final 22 possessions in the first game, 11 of the final 12 baskets were assisted. Unfortunately, Michigan just hasn’t been able to match pass the ball that well this year, with just 47.7% (10th, Big Ten) of its makes being assisted this year in conference play. KenPom projects a 63-58 Illinois win and gives the Wolverines a 26% chance at snapping their three-game losing streak.